Home › Immigration › Refugees: will the Finnish government’s position be dictated by Juha Sipilä or by Timo Soini? Will it be aligned on Angela Merkel or on Viktor Orban? When the Finnish Prime Minister opens his own house to refugees, Angela Merkel opens boldly Germany’s borders to the Syrian refugees, followed with some reluctance by Francois Hollande in France and David Cameron in the UK. Will Finland follow the German Chancellor, or stay in the group of opponents led by Hungarian autocrat Prime Minister Viktor Orban, who sees the arrival of refugees as a Muslim invasion and has built a wall on its border? The Finnish Prime Minister Juha Sipilä has offered Saturday to host refugees in his empty house, located in Kempele, 500 km north of Helsinki. He explained “my house is not so much in use now“. Before that, he had already launched multiple calls to the Finns to show solidarity towards those who arrive in the country, and when proposing his house, he said: “I hope this will become a sort of popular movement that will inspire many to take their share of responsibility in this housing crisis of refugees. I want to make my contribution to the building to show that Finland is a multicultural country“. It shows that he is personally a good person, but as a Prime Minister it will not be sufficient: the reception capacity of Finland for asylum seekers is now saturated, with 25,000 to 30,000 asylum applications expected in 2015, seven to eight times more than in 2014. The public authorities are pushing to open more centers or to increase the capacity of existing ones, but it is quite difficult with the opposition of one of the main parties in the governmental coalition (populist extreme right Perussuomalaiset, the Finns’ Party) and, according to YLE news, local opposition in a number of towns such as Askola, Hämeenkyrö, Kuortane and Taivalkoski, and in the region of South Ostrobothnia. He may be inspired by Angela Merkel, who has not only shown her kindness for people obliged to leave their countries because of the ongoing wars, but has also taken a bold move as a real leader. Berlin has announced on the 25th of August that it will stop sending back asylum seekers to the country by which they entered the European Union, even if it was provided for in the Dublin agreements. The move was recognized by the European Commission as an “act of European solidarity.” “This is a recognition that we can not leave the Member States at the external borders only manage the large number of asylum seekers seeking refuge in Europe,” said Natasha Bertauds, spokesperson of the European Commission. Germany is still the only one who made the decision among the member states. But according to Newsweek, the second motive has little to do with generosity. Accepting skilled and educated refugees like Syrians is in Germany’s economic self-interest, and the educative system in considered of good quality, with 9 years of education and a good university system, with in particular a strong emphasis on engineering and medecine. The German population is falling rapidly, in part because of low birth rates, and the German economic machine needs new qualified workers. Finland could think about these arguments, and offer a little more than the house of the Prime Minister… beginning with lifting Finland’s opposition to sharing the burden of refugees. Criticized for its lack of involvement in the refugee crisis, Prime Minister David Cameron has been under an increasing pressure of public opinion in Britain, which calls for more aid to refugees and migrants. He has announced that the UK is finally ready to “do more” to overcome the crisis of migrants in Europe. “Given the scale of the crisis and suffering people, I can announce today that we will do more, welcoming thousands more Syrian refugees,” he has said to the press in Lisbon after a meeting with Portuguese Prime Minister Passos Coelho. “We continue our approach of get them from refugee camps,” he noted, referring to the camps by the UN High Commissioner for Refugees on the Syrian border. “This gives them a safer and more direct route to the UK, in order to avoid the risk of a hazardous journey that has made so many dead“. This could be an important point to discuss among the EU Ministers. Francois Hollande, the French president, has recently joined Angela merkel’s position, after showing some reluctance to accept more refugees. Finland has not be really involved as a host country in previous times when refugees have flooded in some European countries. At the end of the 15th Century, Jewish people have been pushed away from Spain, and then the European wars of religions have pushed out of their countries hundreds of thousands of people. During the last century, in 1933, when the Nazis took the power in Germany, 60 000 Jews were fleeing the country and became refugees, without serious difficulties in the countries where they arrived. However in 1938, after German’s invasion of Austria, the Evian conference has been a failure which may have cost the lives of hundreds of thousands of Jews who were prevented from leaving Germany and Austria. According to Wikipedia, it was convened at the initiative of United States President Franklin D. Roosevelt in July 1938 to respond to the plight of the increasing numbers of Jewish refugees fleeing persecution in Europe by the Nazis. For eight days, from July 6 to 15 at Évian-les-Bains, France, representatives from 32 countries and 39 private organizations and some 24 voluntary organizations met and formally discussed the issue among themselves. The dispossessed and displaced Jews of Austria and Germany were hopeful that this international conference would lead to acceptance of more refugees and safe haven. Hitler responded to the news of the conference by saying essentially that if the other nations would agree to take the Jews, he would help them leave. As it may happen now in Brussels, national egoism and hypocrisy made that the conference proved a failure: the countries refused to accept more refugees, the result being that the Jews had no escape and were ultimately subject to what was known as Hitler’s “Final Solution to the Jewish Question”. Are we going to behave in the same way now? Some of the conditions are similar, with an economic crisis which provokes fear in front of the arrival of large number of refugees, and with the populist/extreme-right parties more powerful in certain European countries than in the thirties. 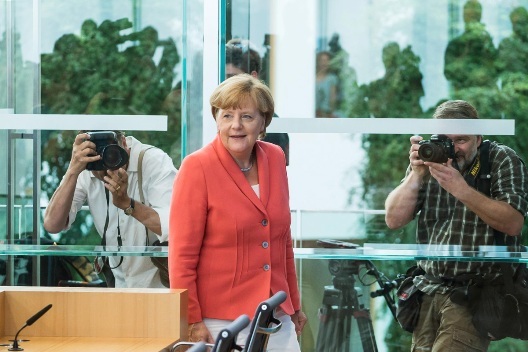 But Angela Merkel’s position has provoked positive evolution in a number of countries who are more opened to help and support the Syrian refugees: France, UK, Netherlands for example have changed their minds about the question of quotas. So is Finland position going to be defined by Juha Sipilä or Timo Soini? By generosity or by fear? THE BACKLASH HAS BEGUN in the UK against the biased media campaign in favour of immigration. A new survey shows that 64% support Cameron’s refusal to sign up to Merkel’s EU migrant sharing plan and only 21% think he is wrong – a totally different result to the false impression given by Sky, the BBC, Channel 4 and the Guardian. Also there has been a sudden significant swing to NO side in the EU referendum, with 51% saying they will now vote to leave. Among those saying they will vote to stay 22% say they will switch if the immigration crisis gets worse. Demand an end to the war on Syria so these poor people can return home where they want to live in peace. Blaming a series of media for their interpretation and taken one survey (when done, how many respondents, where was the survey held) as the righteous answer to questions. That very poor for a critical comment. Second I would like to point out that the questions asked are quite misleading or better setting for answering direction. Very poor indeed!! Third: combining sidewise-related issues such as Brexit (basically polito-economic) and the issue of refugees is at least very very very poor!! You get the answers that the medium MailonSunday wants to publish. MoS is not exactly known for its critical points of view. More like tabloid-like informing. Nice for you to read but not convincing to me at all! !